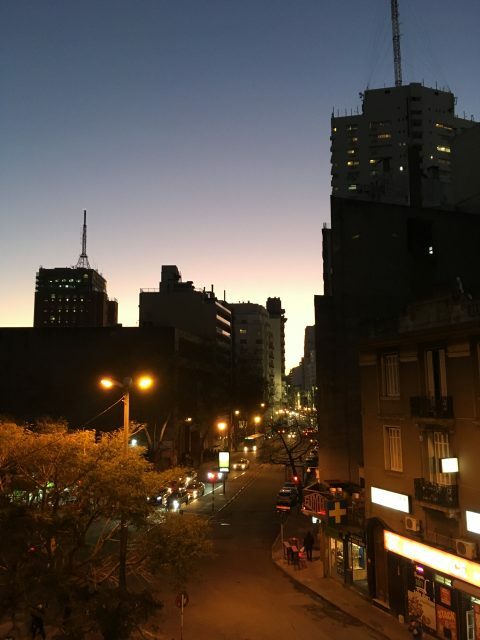 After just a day in Montevideo both Brett and I think we should have scheduled more time in Uruguay. We should have given ourselves time to get off the ferry and explore the historic city of Colonia for a few days before traveling down to Montevideo for longer than the three days we will spend here. The trip over to Uruguay from Buenos Aires yesterday was a bit rough, to be honest. Getting to the ferry terminal on Sunday morning was a breeze – we had arranged for the same taxi driver who had brought us from the Buenos Aires airport to take us to the terminal. He was on-time and affordable. Going through immigration was easy as well – we were stamped out of Argentina on one side of an aisle in immigration, then turned around and had our passports stamped to enter Uruguay on the other side! Easy-peasy. The ferry was HUGE, and we boarded easily and found seats quickly. They were sort of like airline seats, but a bit more comfortable (although with just as little leg room). However, instead of maybe six or seven seats across, the ferry rows had more like 30 seats across, with aisles between every set of three, and every seat was filled by the time we departed. There was an elaborate snack bar up at the front, but after over-paying for a bottle of water at the terminal we avoided it. We learned that some of the ferries that make the longer three-hour trip from Buenos Aires direct to Montevideo provide restaurants and even a tango show! Brett and I instead nibbled on some leftover crackers during the voyage which turned out to be a smart thing. The trip across the Rio de la Plata (Silver River) started out smoothly, but got rougher the farther across we traveled. 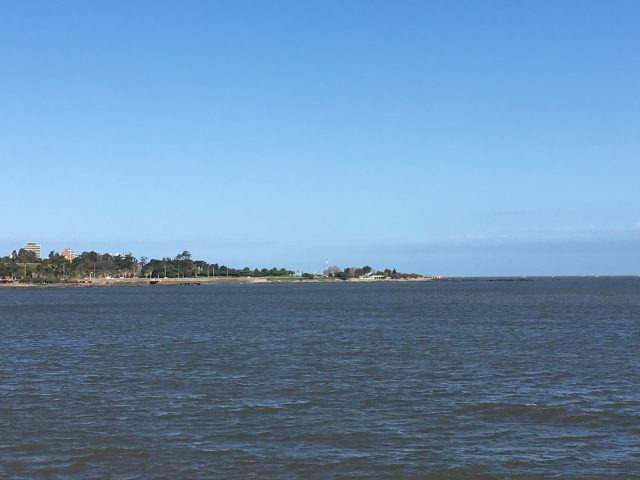 The Rio de la Plata is the widest river in the world, over 140 miles across at one point, and even the “short” trip to Colonia takes an hour and is more like crossing a lake. It was a windy day yesterday so the water was quite choppy which of course meant the ferry bobbed up and down quite a bit as well. Brett, an experienced sailor, handled it well but even after taking motion-sickness medication before embarking I was not feeling well at all by the time we got to Colonia where, after passing through what has to be the most ridiculously easy customs ever, we got right onto a stuffy, uncomfortable bus for a 2 1/2 ride down to Montevideo (we chose this option to save money). I tried to catch some of the scenery as we rolled along but mostly I tried to keep myself from getting sick (all I remember today are lots and lots of farms and lots and lots of date palms). I was glad for those crackers! Never judge a book by its cover – the front of our apartment building (door is on the left) gave no hint of our lovely apartment inside. 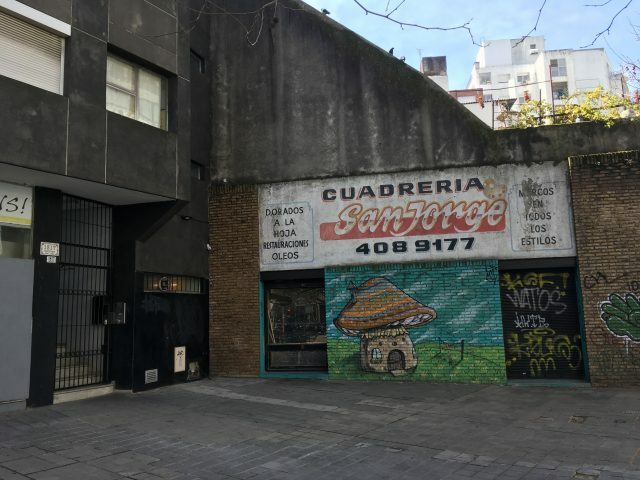 Graffiti covers the side of an old apartment building n Montevideo. The graffiti is everywhere in the city, most of it tagging, but political statements can frequently be seen as well. Old and new buildings sit side by side throughout the city. Colorful street art can be found as well. Upon arrival at the bus station in Montevideo we retrieved our suitcases, found an ATM and got some Uruguayan pesos and then hired a cab to take us to our apartment. Our lovely host, Fernanda, met us there and explained everything about the apartment and then left us to decompress. 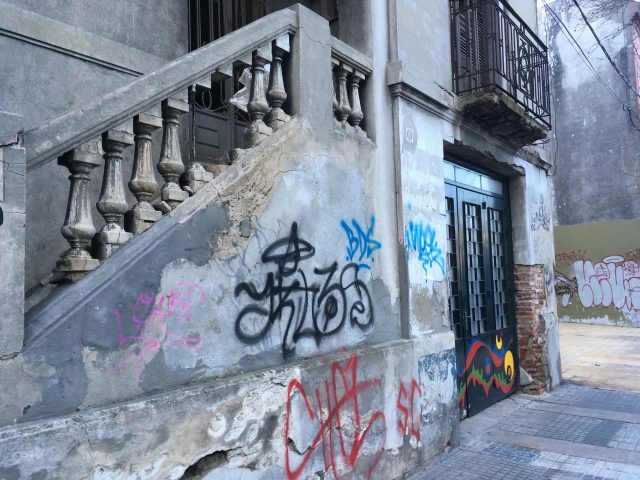 Although the front of the building looked a bit sketchy after our posh digs in Buenos Aires, the inside of the apartment was clean, cute and cozy with everything we needed for a comfortable stay. As it was Sunday, NOTHING was open except (thankfully) a Subway sandwich shop across the street, so that’s what we had for dinner. We were able to buy coffee and orange juice for the next morning at a mini-mart, and we both fell asleep early and slept soundly for twelve hours! Lots of food (and wine) for just under $70US – we’ll eat well for the next three days! We woke this morning to a cold but beautiful day with clear blue skies. Our first chore in the morning was to get ourselves some more Uruguayan pesos, and then some groceries for the next three days. Brett went out to check out one nearby ATM nearby on his own but it was out of cash and the bank didn’t open until 1:00 p.m. (ATMs are all attached to banks here). 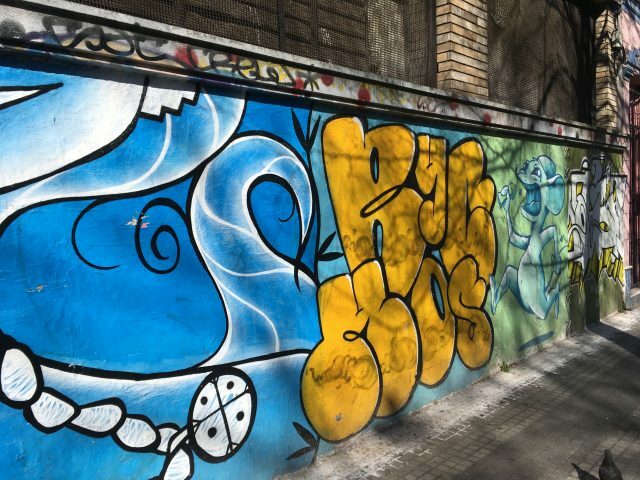 So, we waited until 1:00, got our pesos and then set out to find a grocery store – easier said than done because even though we had checked out locations on Google Maps, nothing looked like a grocery store from the street. We finally entered what appeared to be a discount quick-mart from the front, but which held a full supermarket at the back. 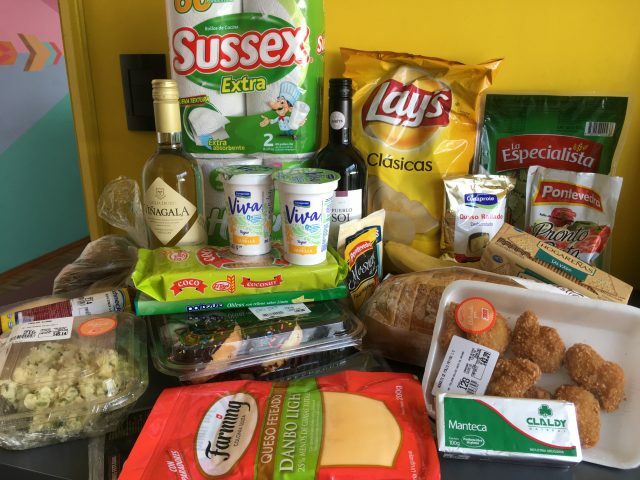 It turned out to have a better selection of groceries than stores we had visited in Buenos Aires, but prices were definitely higher here. 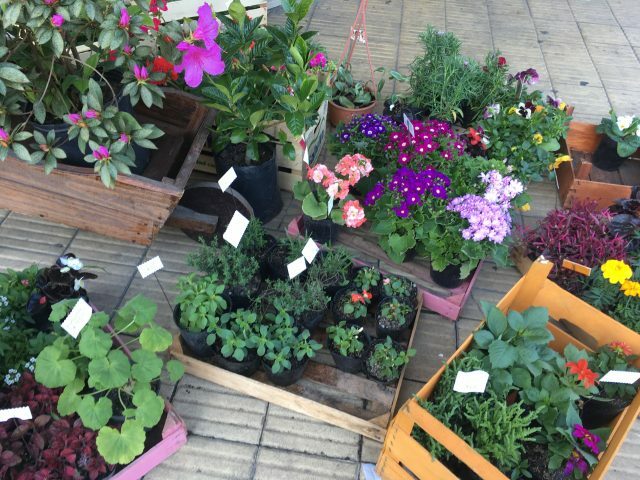 Also, the produce section was surprisingly small (almost non-existent, really) with very little to choose from and, unlike Buenos Aires, we have so far not seen any independent produce stalls on the street nor any bakeries either. I’m hopeful they’re around though. Looking out on the Atlantic Ocean from La Rambla at the Parque Rodo neighborhood of Montevideo. 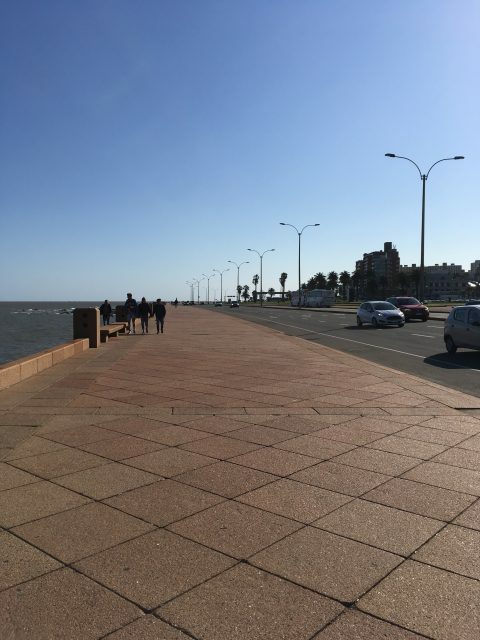 The place we wanted to visit first in Montevideo was La Rambla, the broad avenue which goes all along the coastline of the city, from the Rio de la Plata on the west to the Atlantic ocean on the south. Almost 14 uninterrupted miles long, it has the world’s longest continual sidewalk, and is under consideration as a World Heritage Site. La Rambla has been called the “identity of Montevideo” as well as “the lungs of the city.” The wide sidewalk is used by city dwellers for walking, skating, fishing, sunbathing and so forth. There are several beaches along its way as well, and no buildings are allowed on the water side of La Rambla so that views are not interrupted. It took us a bit longer than we imagined to walk to it from our apartment, but it was worth the time in spite of the wind we experienced. It was exciting to get our first view of the Atlantic Ocean! Tomorrow we are heading out in the morning for a free walking tour of Montevideo’s historic Old Town and we may try to visit another division of La Rambla if we can. Wednesday’s schedule remains up in the air as rain is forecast for the entire day. We have laundry to do though and a bit of repacking to take care of before we depart for Paris on Thursday morning so we’ll be busy no matter how things turn out. Evening approaches the city: the view from our balcony. I’m curious. What happens to the foreign currency once you leave a country? I’m sure you must have a little left over in your pocket. How difficult is it to convert to your new location. We try to spend all of our local cash, or as much as possible before we leave. We’re saving all the odds and ends though to give to our grandson when we arrive in Japan with the idea that he can maybe begin a collection of foreign currency. We have to keep reminding ourselves that we’re south of the equator here and it’s spring that’s getting ready to arrive, not fall. It still mostly looks like winter though, that fall is already here so it feels all mixed up. I think if more trees were started to leaf out it would make more sense. I used to suffer from motion sickness way more frequently than I do now and have it mostly conquered now, so this trip felt like a setback. Brett said if we ever do something like this again we’ll make sure I have access to fresh air (i.e. ride first class) or we’ll fly. I’ve heard it said that two happiest days of owning a boat are the day you buy it and the day you sell it. Fresh air with a horizon to look at and crackers are a must! Also, I learned from my husband years ago to take Bonine or Dramamine the night before so it’s in your system. And you get a good night’s sleep! Outside of the crackers, both fresh air and a view of the horizon were missing on the boat ride over to Colonia, which explains a lot. I take Bonine, one pill an hour before travel and other right after I board. It works for airline flights, but have never heard about taking it the night before. That would have helped a LOT, including getting a good night’s sleep. I’m going to try this before our flight on Thursday.